Neda Shabani (left) and Soroush Agahi (right) members of Iran's Baha’i faith were arrested on Wednesday, November 28. 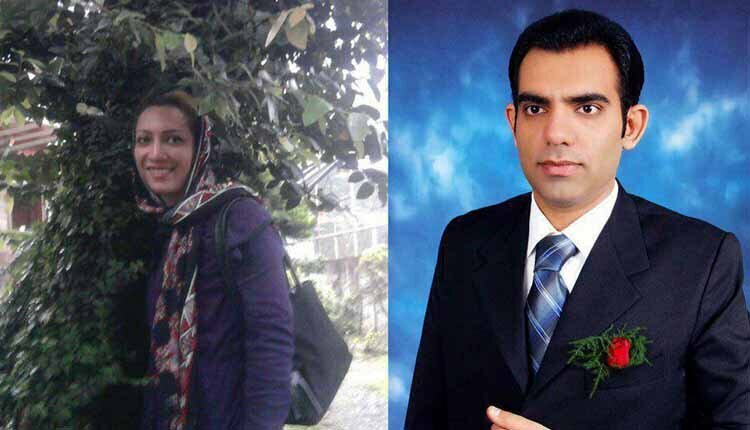 On Wednesday, November 28, security agents arrested two Baha’is in Karaj near Tehran and took them to an unknown location. The two detainees have been identified as Neda Shabani and Soroush Agahi. Meanwhile, Dorri Amri (Esmailpour), 44, began serving her one-year prison sentence in Vakilabad Prison in the Iranian city of Mashhad on November 14, 2018, for allegedly propagating her Baha’i faith, according to the Center for Human Rights in Iran (CHRI). Amri, along with two other Baha’is, May Kholousiand Shayan Tafazzoli, had been arrested by agents of Iran’s Intelligence Ministry in Mashhad in June 2014 during a prayer session in Kholousi’s home. Afew days later, Kholousi’s daughter, Saghi Fadaie, was also arrested. Fadaie was freed after 85 days while Amri, Kholousi and Tafazzoli were released on bail after five months. Tafazzoli and Fadaie, both 28, were denied university admission in 2008 because of their religious beliefs despite having passed the national enrollment exams, according to the source. Members of the Baha’i community in Iran have been faced in recent weeks with a new wave of intensified persecution, including arrests, discriminatory court verdicts, and shop closures, for merely practicing their faith, according to the the Baha’i International Community (BIC). More than 20 Baha’is have been arrested in various cities in the provinces of Tehran, Isfahan, Mazandaran, and East Azerbaijan in the last two weeks alone. Over 90 Baha’is currently remain imprisoned in Iran, BIC reported. The community said in a November 23 statement that up to a dozen Baha’is have in recent days received discriminatory and harsh court verdicts across the country. Nine Baha’is in Isfahan were falsely charged with“membership in the unlawful administration of the perverse Baha’i sect for the purpose of action against internal security” as well as “engaging in propaganda against the regime of the Islamic Republic” based on various absurd pretexts,including praying with others. The nine Bahá’ís were served a combined sentence of over 40 years of imprisonment. Over a dozen Baha’i-run businesses were shut down by the authorities in Khoramshahr, Ahvaz and Abadan in Khuzestan province this month in connection with the owners closing their shops temporarily to mark two major Baha’i holy days. On Wednesday, November 28, security agents arrested two Baha’is in Karajnear Tehran and took them to an unknown location.